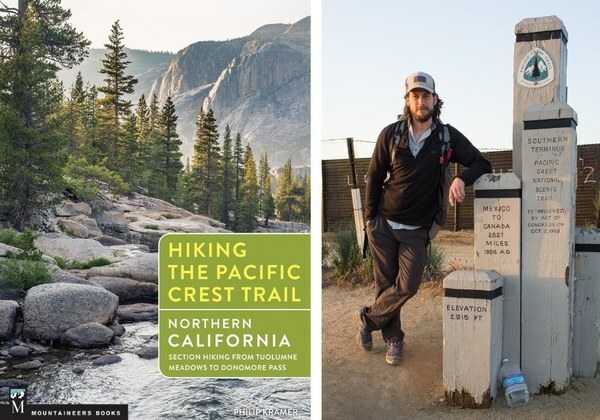 The authors of Mountaineers Books' "Hiking the Pacific Crest Trail" series offer their top tips to help you prepare for their respective sections of the trail in Southern California, Northern California, Oregon, and Washington. 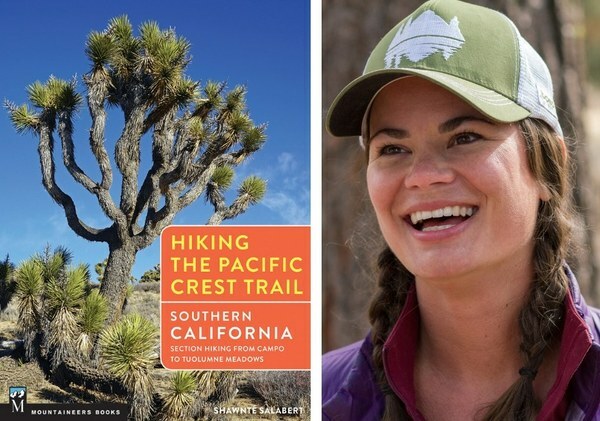 Whether you're planning a section hike or a thru hike, our experts are here to help. 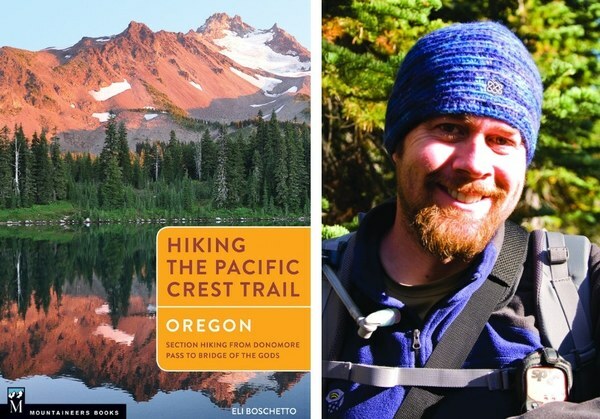 We asked the authors of our Hiking the Pacific Crest Trail guidebooks to give us their top tips to prepare. My first tip for those who are considering hiking the “Southern California” section of the PCT is to disavow yourself of the notion that the first 700 miles of the trail—all of that great stuff located south of the High Sierra—is nothing but hot, dry, dusty, boring desert. Quite to the contrary, those miles serve as a veritable natural history museum for the State’s southernmost (well, and central-most) splendor. Yes, you will hike through lots of (amazing, beautiful, awe-inducing) desert landscape. You’ll see cactus gardens in bloom during the early spring, you’ll spot lizards and tarantulas and coyotes making their way across the sand, you’ll earn breathtaking vistas from any number of rocky promontories. The two biggest concerns you’ll have are sun exposure and water availability. For the former, you’ll want to wear loose, light-colored clothing that covers as much of your skin as possible. A hat and sunglasses are par for the course, but a sun umbrella, which reflects the light—and heat—away from your body, makes for a much more comfortable journey on a hot, shadeless day. Also consider the value of a good ol’ nap—hike early in the morning, rest under the cool shade of a rock or tree, then continue into the evening, when the temperature is cooler. Water is also a common concern in Southern and Central California, especially as we remain in a multi-year drought phase. Luckily, a pair of kind souls named Double Tap and Halfmile maintain the PCT Water Report, which is updated daily during the thru-hiking season, and nearly as often during the “off-season.” The report is available online; you might want to download an updated copy to your phone whenever you have service. Waterless segments of trail can stretch upwards of 25 miles long in some cases; be sure you have enough carrying capacity (water bottles and bladders) to last during these miles (and the inevitable dry camps you’ll face)—I often had capacity to carry 6 liters on this section of the trail. Of course, as I mentioned, the first 700 miles of trail reflect a variety of terrain, including six mountain ranges before you hit the high peaks of the Sierra. Mid- to high-altitude slopes can retain snow well into early summer, especially on their north-facing aspects. Be diligent about checking snow and weather conditions during late spring and early summer; a great resource outside of the usual weather reports is the PCT Water, Fire, Passes, Fords Updates Facebook Group. Travel in these areas, beginning with the San Jacinto Mountains, during winter or shoulder season conditions often requires additional equipment—ice axe and crampons—and the skill to safely navigate snowy and icy terrain. At the risk of sounding like a broken record, my first piece of advice echoes Shawnté’s; forget any notions of what you think the trail will be like—Northern California isn’t all trees, I promise. 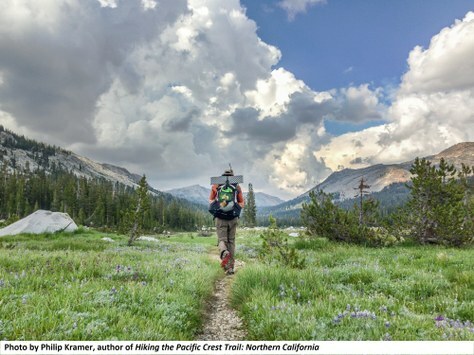 The PCT covers roughly 750 miles between Yosemite and Oregon and the terrain, along with the experience, varies hugely. Ditch your expectations (good or bad) and don your curious explorer’s cap—beginner’s mind or bust! If you plan to start hiking this section from Tuolumne Meadows, you’re in for a Sierra treat but you’ll want to be in hiking shape. The first several passes north of Tuolumne boast some of the steepest grades on the PCT and you’ll be huffing that thin alpine air. If you can’t get out and train with your pack on, maybe tackle a 30-day squat and lunge challenge before departing? Your hardened quads and buns will come in handy on other major Northern California climbs out of Sierra City, the Middle Fork Feather River, Belden, Castle Crags, and Seiad Valley, too. Sadly, California is becoming synonymous with drought, and water is a frequent consideration in Northern California. The PCT Water Report can be useful here, but it isn’t as religiously updated as it is in Southern California. Pay attention to the distances between sources and the seasonality of each one. The most notorious dry stretch is a 30-mile traverse of the Hat Creek Rim where, depending on your definition of water and your desperation (think murky cow pond), you may need to carry enough H2O to hike the entire stretch. Another potentially dry stretch that often catches hikers off-guard is the climb from Interstate 5 up through the Castle Crags. Water can be very scarce here in late season or during a drought year and it’s a long, hot, exposed slog to the ridge. On a more general note, I always encourage lolly-gagging. We live in a fast-paced world where speed and efficiency are highly valued. Sure, sometimes you want to cruise through the day’s miles, but much of what surrounds you on the PCT is relatively hard to reach, and who knows when you’ll be back?! Take your time! Thru-hikers often take "zero days" (a day with no miles hiked) in trail towns and I like to challenge hikers to take a zero day on the trail. It’s hard to do as a thru-hiker but easy to plan for as a section hiker. You’ll get so much more out of your adventure if you take the time to explore. My absolute favorite part of my book research was venturing off the PCT to nearby lakes, rivers, and mountaintops and discovering new nooks and crannies around every corner. 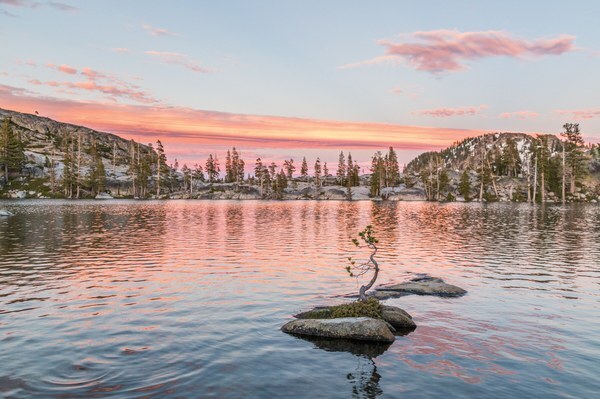 In these sections you’ll find prime High Sierra terrain without the crowds of the central and southern Sierra, the stunning lakes of the Desolation Wilderness, and the rich flora and fauna (along with impressively rugged topography) of the lesser-known Klamath Range. Your comfort level on trail can make or break any long-distance trek. If you’re freezing, hungry and miserable just to cut your pack load by a few ounces, you’re likely not going to have fond memories of your journey. If you’re depressed because you’re sick of ramen or wearing the same soggy socks, it’s likely going to taint your perception of a scenic view or a pretty meadow. After all, hiking should be for pleasure, not punishment. That’s why I’m a firm believer in packing along a few creature comforts. When you’re out in the middle of nowhere for days, weeks or months on end, these can go a long way to keeping your spirits up—especially on the more challenging days, when weather, temperature, or trail conditions may not be ideal. Packable pillow. This can be much more comfortable than a wadded-up jacket—and because good sleep is important. Indulgent snacks or treats. These can be great pick-me-ups after tough slogs or as rewards following difficult days. Extra socks. One of the best ways to ensure an enjoyable hike is to be kind to and take care of your feet. Something fun. A book, a journal or a game can give you something to do or help you wind down in the evenings, or keep you from going stir-crazy if you have to wait out a rainstorm or recover from a minor injury. And don’t be bothered by pack weight shamers. There is no rule that says all hikers need to be ultralight minimalists. That is a packing theory that does not work for everyone. Remember the motto, “hike your own hike,” and do what’s comfortable for you. When hiking in late spring and early summer—especially in the Northwest—mosquitoes are no laughing matter. In recent years, it seems their hordes have multiplied and become even more ravenous. Last summer, while hiking the PCT through southern Oregon, I had real fears that I would be carried off and devoured by the throngs of winged vampires I encountered—even while fully covered in long pants, long sleeves and headnet, and slathered with bug repellent. It was a miserable experience, and several hikers I met abandoned the trail out of sheer mosquito madness. So my word to the wise is plan your early-season hiking accordingly with mosquitoes in mind. In the Northwest, mosquito season usually begins with the snowmelt in mid- to late spring and can last until mid-summer. Of course, there are trade-offs if you choose to do your hiking in the later, bug-free months. 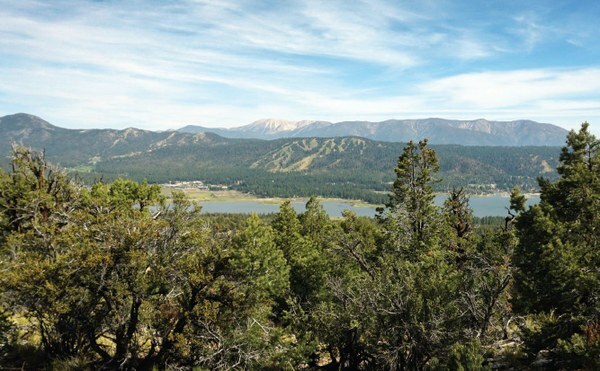 You may miss the peak wildflower season or, depending on the previous winter’s snowpack, there may be concerns about the availability of good water. Cover up. Wear long pants and sleeves, socks and a hat. Consider a headnet. Choose loose clothing that they can’t penetrate right to your skin. Use a repellent. In the Northwest, mosquitoes can transmit West Nile Virus, which can cause a variety of symptoms, including headaches, fever, disorientation and, in rare cases, paralysis, seizures and death. Pack a no-cook menu. If the bugs are so bad that you can’t cook outdoors and have to retreat to your tent, have food items that you can eat in your tent that don’t require using your stove. But remember, don’t store food in your tent overnight. Bring after-bite treatment. Despite all your efforts, you will get bitten—probably a lot. Pack along a small after-bite remedy to help reduce the swelling and itchiness. This is can be especially beneficial at night when you’re trying to sleep and recharge for the next day. When it’s sunny, the PCT in Washington might have you dropping to your knees in sheer bliss overcome by eye-popping beauty at every turn. But, due to the proximity of the Cascade Range to the Pacific Ocean, the maritime-inspired storms can frequently pack a punch. Travelers who hike Washington should prepare for rain, rain and more rain (with a twist of chilly wind). 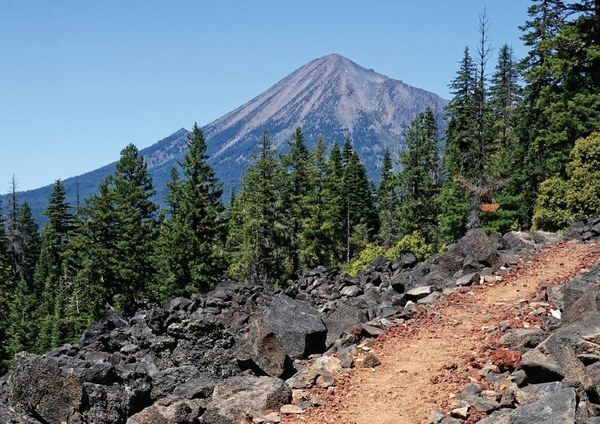 While ventilated boots or hiking shoes might be an excellent idea for other parts of the PCT, it’s rarely hot or dry enough, even during summer months, to warrant them in the Pacific Northwest. Even if it doesn’t rain, the dew on the foliage often is enough to soak your shoes. Unless your feet get smokin’ hot and you need that exceptional breathability, consider a pair of waterproof footwear. You’ll also want to be sure your lightweight waterproof pants and jacket are breathable enough to handle days of soakings without leaking or creating a steamy microclimate under their protective shells. Of course, make sure you know how to set up your tent quickly and adequately, so you aren’t doing a mad scramble of frustration as everything drowns in your efforts. Weather prep is crucial and, if you get lucky and don’t get any rain, your sun dance worked! Please teach me your moves. Take it slowly and enjoy every square inch. Even tough thru-hikers coming all the way from the Mexican border are forced by topography to take it easy in Washington. And why not? After all, you came to marinate in its raw, untamed, beauty. 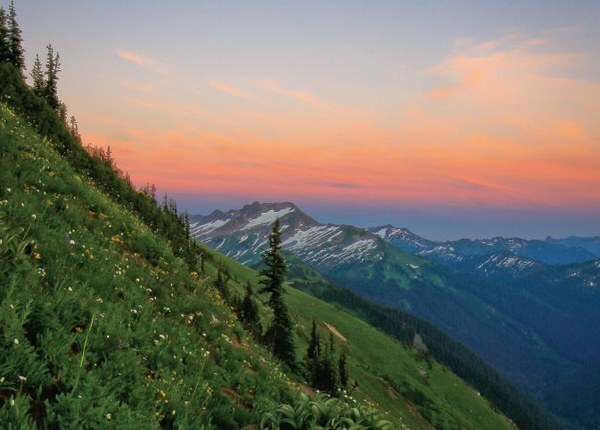 By its very nature with high rugged peaks leading to rushing river valleys, Washington is a quad burner and will test your fitness prowess, especially with a full pack. Plan your itinerary to ease into the aches...um, I mean…trip, and start with shorter days, gradually building up to longer ones. Acclimate not only your body to the pack weight but also your feet. If you notice any hot spots, stop immediately and treat them, since blisters can quickly put the kibosh on a well-planned trip. When you stop for a break, be sure to indulge in the late summer huckleberries which are prolific through the entire state. Just be careful not to eat too many and succumb to bloated-berry-belly-n-bad-news-bowels, a rather unpleasant malady to say the least! Where else can you find a cinnamon roll as big as your face a short distance away from the PCT? Visit Stehekin! It might sound odd that one of my tips is to check out a trail town, but Stehekin is like nowhere else you’ll ever see. The PCT pops out at the Stehekin Valley Road, where a North Cascades Park sanctioned shuttle bus offers hikers rides down the valley to the unique, hamlet. Only accessible by boat, plane, hoof, or foot, the landlocked Stehekin feels like you’ve entered a magical village where time has been frozen for years. The minuscule resident population grows produce, raises chickens, mills timbers, and lives a primitive lifestyle looking for tourists to help fund their rural efforts during busy summer months. Be sure to stop by the bakery, the gardens, the old Buckner Orchard, the old school house and Rainbow Falls. Rent a bike for the day by dropping a couple of dollars into the we-trust-you money box, or talk to the folks at the North Cascades Lodge where you can rent a kayak to check out the petroglyphs on the far side of Lake Chelan. Camping is available in town or you can treat yourself to lodging at the Stehekin Valley Ranch, North Cascades Lodge or a number of private cabins. Why not make your hike a multifaceted journey? You only live once! 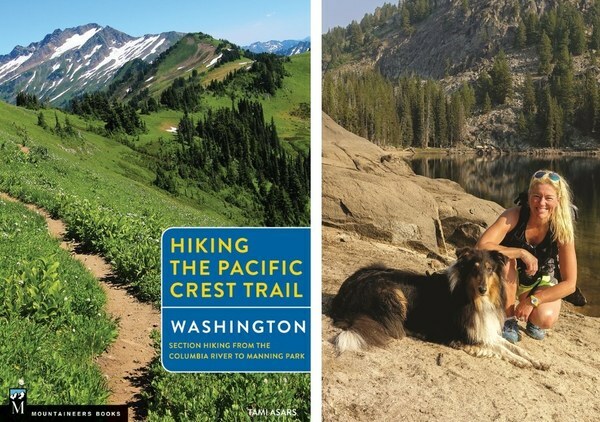 Learn more about the series at www.pctguides.com, and follow the authors on Instagram @hikethepct.